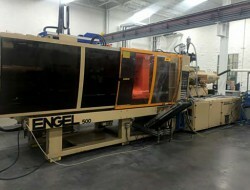 500 ton Engel - Installed new in 1998 - Model ES2000/500 - 27.53 oz. shot - CC100 Controller - Low Hours! Tie Bar Distance :::: 33.07" x 33.07"
Platen Size :::: 47.24" x 47.24"
Shot Size :::: 27.53 oz. Request a quote today for pricing and additional photos of this Engel.